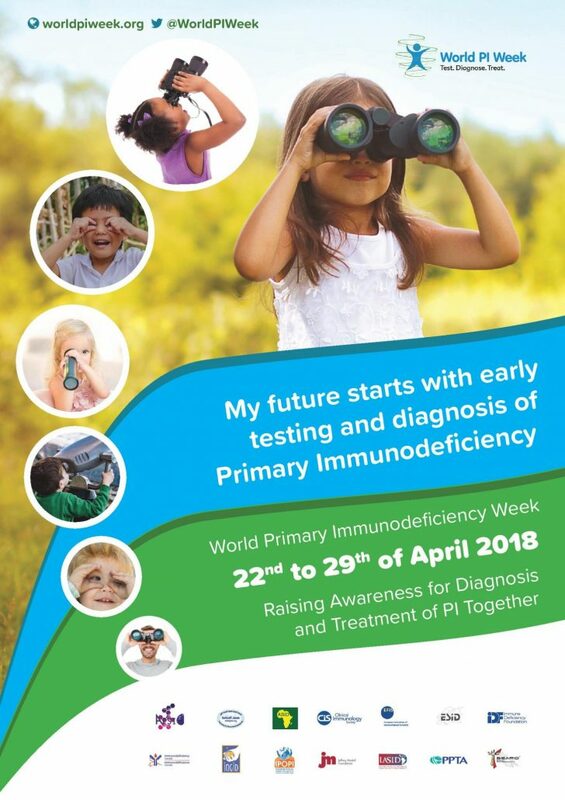 The 8th edition of World PI Week (WPIW) will focus on early testing and diagnosis of primary immunodeficiencies (PIDs) under the motto ‘My future starts with early testing and diagnosis, pursuing improved quality of life for people living with these diseases worldwide. IPOPI is again engaged in planning the global primary immunodeficiency week, celebrated annually between April 22-29, and looking forward to hearing all about the national campaigns carried out by our National Member Organisation (NMOs). IPOPI invites you to join the campaign on social media by sharing the WPIW materials and your events and activities using the dedicated hashtags #WorldPIWeek2018 #WPIW. You can take part in the WPIW photo contest by posting or tweeting pictures featuring the WPIW colours (blue and green) with the hashtag #PIctureawareness. More surprises to be announced on April 22!